With the Minister of Foreign Affairs of Denmark and Future Place Leadership, AmCham in partnership with Invest in Denmark held the 2018 Foreign Investment Summit at Eigtveds Pakhus in Copenhagen. Rounding out the presentations was Senior Advisor Morten King-Grubert from Future Place Leadership, who in his presentation talked about how countries and cities can work with Talent Attraction Management and shared examples and best practices from Nordic and global initiatives focused on attracting international talent. Morten also moderated the conference panel. Read more in the AmCham blog. Panelists included Joachim Knudsen (McDonald’s), André Rogaczewski (Netcompany), Linda Wendelboe (DI) and Anders O. Bjarklev(DTU). There was broad agreement among the panelists that we must all apply pressure on the government and political stakeholders to take action and improve framework conditions to better nurture both Danish and international talent. Panelists included Joachim Knudsen (McDonald’s), André Rogaczewski (Netcompany), Linda Wendelboe (DI) and Anders O. Bjarklev (DTU). Chief Economist Steen Bocian from Børsen set the scene with an overview of ‘the Danish investment climate’. Partner and Managing Director Jesper Damm from Boston Consulting Group presented the key findings of their ‘2018 Decoding Global Talent Report’. To download Steen Bocian’s presentation, click here. To download Jesper Damm’s presentation, click here. To download Morten King-Grubert’s presentation, click here. 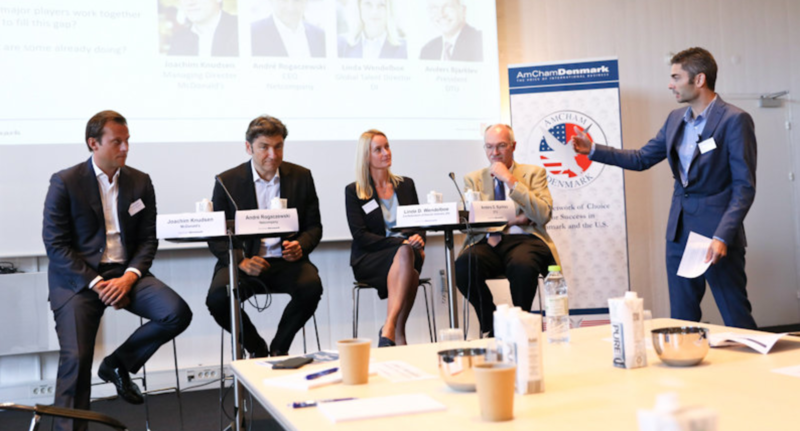 Read the AmCham DK blog. Download BCG’s 2018 Decoding Global Talent Report. Contact Morten King-Grubert, our senior adviser on talent.